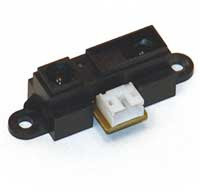 GP2Y0A21YK is General Purpose Type Distance Measuring Sensors from Sharp. (see the product page). Sharp Infrared (IR) radiation Distance Measuring Sensor use Infrared signal to measure object distance from 10 to 80 cm with analog output. The output of this sensor is analog therefore it need Analog to Digital Converter (ADC) to interface the 8051. I use ads7841 as ADC (see this article). 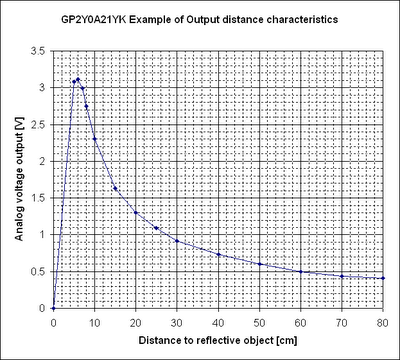 The graph of Analog voltage output versus distance to reflective object are shown in Fig.1. When I plot Analog voltage output versus inverse number distance, I found the linear relation shown in Fig.2. Fig. 1 Analog voltage output (V) versus distance to reflective object (cm). Fig. 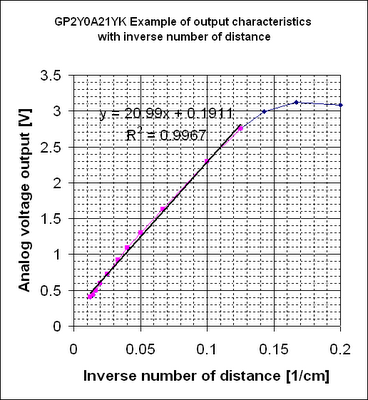 2 Analog voltage output (V) versus inverse number distance (1/cm). The linear equation is y = 20.99x + 0.19, where y is voltage output and x invert distance. Notice that the voltage output I can trust are about 0.4 to 2.8 V.
This is an example code how to interface the distance sensor to 8051. I use SDCC as C Compiler. x = 1/x; // Inverse back get distance in cm.